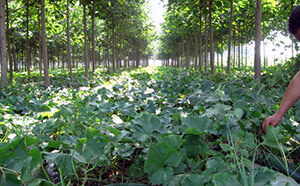 The cultivation of the species of the g. Paulownia can be done together with other cultures, in particular in the first 2-3 years (intercropping). Wheat, corn, soybean, peas, beans, barley, cotton, vegetable cultures, medicinal plants, etc. can be grown between the rows. Farmers can double their income — from the cultures between the rows and from the trees themselves. Paulownia has the ideal characteristics for joint cultivation with other species and can serve as the basis for an effective system of intercropping. The trees provide the ideal microclimate for the additional cultures and increase their yields. The leaves and the flowers of Paulownia are rich in nutritive substances and a good and cheap source of nitrogen improving the chemical constitution and the structure of soils. During the dry season the Paulownia species absorb underground waters from greater depth than the jointly grown cultures whose root systems are near the surface. In this way, they supply water and nutrients for the growth and development of the additional cultures. Paulownia trees protect the jointly grown cultures from the winds and strong sunshine and give them the chance to develop and grow undisturbed which is the precondition for higher yields. 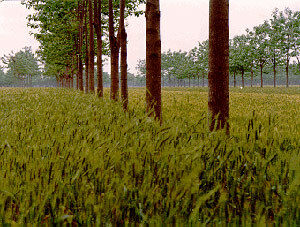 In summer, in the intercropped land, the temperature has been shown to be reduced by 0.2-1.5°C. Besides contributing to boosting the yields from join cultures, Paulownia makes for the natural fertilization of the soil. The leaves and flowers are rich in nitrogen (16-20%), which after fall of the leaf in winter returns to the soil as humus. This enriches the soil to a great extent, and in spring such soils are much better aerated. It is more fertile and ready for growing a variety of cultures. The intercropping system gets more and more widespread in the world. Only in China already 1.5 million hectares are cultivated under intercropping. This system is applied quite successfully also in Australia, Japan, USA and other countries. We are sure that this is the system of the future, as the surface waters get exhausted on global scale and Paulownia with its 5-6 meters deep roots absorb the subsoil water and take it to the surface.